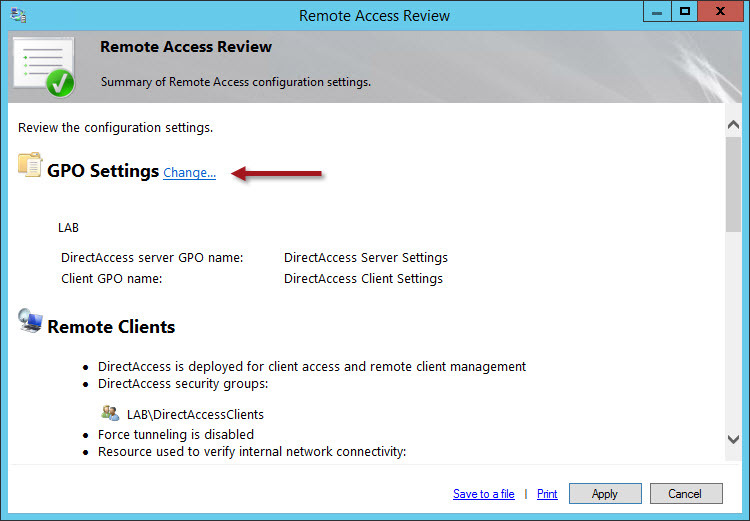 Configuring Multiple Windows Server 2012 R2 DirectAccess Instances | Richard M. Hicks Consulting, Inc.
How about when wanting to have some laptops/users with full DirectAccess connectivity to internal resources, but the rest of the deployed laptops as only having DirectAccess to management servers (such as ConfigMgr and AV servers) for reporting and remote management purposes? Should we again be using two DirectAccess instances for that scenario? Yes, that would be another excellent example of the use of parallel deployments. Full access vs. management only configuration is global in scope, so you’d have to choose one or the other. Having two deployments allows you to tailor those requirements to your specific needs. Thank you for another one of your as ever helpful posts. I do have one question regarding this topic. What are the impacts on the DNS entries created by DA, in particular the AAAA record for directaccess-corpConnectivityHost and the A record for directaccess-WebProbeHost? Will it overwrite the existing entries or have multiple entries for the same name, but then how to limit specific clients to only resolve the entries valid for them?? Apologies for my ignorance with the DNS records, I had a read through your posts on DNS records created and the fact that multi-site will have multi values for the second record, but this is a multi-deployment model which is obviously different. On a different topic, have you come across issues using ECC certificates for the certificate used to authenticate IP-HTTPS connections? In a multisite deployment you will have multiple entries. They won’t overwrite each other. As for using ECC certificates for the IP-HTTPS listener, I can’t say that I’ve encountered that scenario as of yet. I haven’t heard of any issues, however. If your experience is different, please let me know! How about a Scenario where all Systems, independent where they are coming from, will connect to DA. Also all internal clients. Initially the plan was to connect all systems to the same DA instance but then we don’t have the ability in SCCM to differ where the clients are coming from. This is important to us because we don’t want to allow SCCM traffic when the clients are connecting from external sites to avoid possible mobile telecom costs. Perhaps I don’t understand the use case clearly, but I can’t see why having internal clients connect via DirectAccess would be a good idea. I’m not sure there’s a good way to address the SCCM traffic issue over mobile networks either. 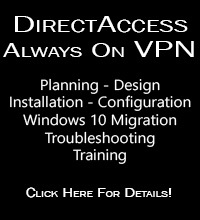 DirectAccess only detects inside or outside, and if outside will establish a DirectAccess connection. It doesn’t have the capability to distinguish between types of network connections (Ethernet, Wi-Fi, cellular, etc.). I don’t know enough about SCCM to say for sure, but perhaps there’s a detection method that can be used by SCCM to detect the link type? Windows 8 and 10 clients have built-in metered internet connection types for interfaces, and SCCM will honour those and not download using that interface, unless you force to override for a particular deployment (e.g. emergency patches). Windows 7’s not that intelligent though. Slightly off topic for the above post but I couldn’t find one specifically talking about multi-site. I have a single site, single server 2012 R2 DA set up running with only Windows 7 clients at present – no OTP configured either. I want to start adding three more servers in different geographical locations but at the same time our business will be gradually moving to Windows 10. My question is can I run a multi-site DA deployment with both Win 7 and Win 10 clients concurrently and if so are there any pitfalls? I already understand the limitation of Win 7 clients having to be associated with a single DA entry point but is there anything else? Again on multisite rather than multi instances; can you add sites on an ad-hoc basis? By that I mean can I add subsequent entry points whenever I choose after enabling multiste or must all entry points be added when running the wizard. You can add additional entry points ad-hoc, yes. Once you enable multisite you can add additional entry points at any point in the future, as needed. I am trying to configure this setup but I have run into an issue whereby I cant select to use a self signed cert on Step 3 of the wizard for the network location server. Is there a way around this? This happens when a computer certificate has been issued to the DirectAccess server. You can choose to keep and use that certificate, or delete the certificate and use a self signed certificate (not recommended). Keep in mind that if you delete the existing machine certificate, you won’t be able to support Windows 7 clients or a variety of other important features that rely on certificate authentication (e.g. load balancing, multisite, etc.). I ran that PowerShell script which hung and did not return the prompt. I left it for 10 minutes and still nothing so I cancelled it. After rebooting the servers it has been added. Step 3 of the wizard still shows as an invalid certificate but all is working. I just viewed some of your videos on DirectAccess on PluralSight. Great information! We currently have 110 folks distributed across six locations with our main site in Austin, Tx. I’ve setup Windows 2012 R2 data center running as DC, DNS and SCCM 2012 R2 at each location. SCCM 2012 R2 runs IIIS to support PXE boot for OS deployments. Running DirectAccess on a domain controller isn’t expressly unsupported, but it certainly isn’t recommended. You’ve also got quite a few workloads running on the server already, so I’m not sure what the experience is going to be like. DirectAccess is CPU intensive and adding it to your existing server may result in degraded performance for all services. What setup would you suggest? We’re a non-profit, but we get Microsoft licensing at a huge discount. I got single site with 200 remote users. If I convert the site to multisite, do I need to bring users back to apply new GPO? Are my users will lose connection? Yes, that’s correct. Switching from single site to multisite DirectAccess will result in the IPv6 addresses used for IPsec tunnel endpoints changing. When this happens, clients are immediately disconnected and won’t get the updated information until they update group policy, which obviously can only happen when they are connected to the LAN again (either directly or via some other VPN technology). No, it does not. 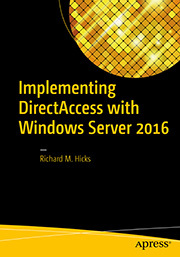 DirectAccess policies are applied globally to all provisioned clients. If you require different levels of access for specific users, it would require a separate deployment. However I’ve found if you just rename the GPO using Group Policy Management Console, the updated GPO name is reflected in the Remote Access Administration console. It must query the GPO GUID and not the name. Hi Richard! From searching the internet for tips and tricks for DirectAccess you seem to have the most experience by far. These posts are extremely helpful. My question is about two single DA deployments in parallel, within the same domain, each running 2012 R2…When publishing the secondary DA configuration, there seems to be no way around the newly renamed GPO’s to be linked at the root domain level. However it seems that security filtering does not do its job properly and the GPO applies to laptops within the organization that shouldn’t receive the configuration, therefore causing issues internally until it is manually addressed. I contacted Microsoft and they mentioned that renaming the group policies of “Direct Access Clients (or Servers)” puts it in an unsupported configuration, and they can only suggest using a different domain. What are your thoughts on this? They couldn’t answer my question of why we have the ability to change the GPO names if it makes it ‘unsupported’. Keep in mind this is all through the DirectAccess Management Console, so we’re not changing directly. I’m trying to stand up a second deployment for the exact reason you mention in this post, so I do not disturb production, however when publishing it causes weirdness with GPO’s that are applied that shouldn’t be. I think you got some bad information regarding the renaming of GPOs and its effect on DirectAccess supportability. 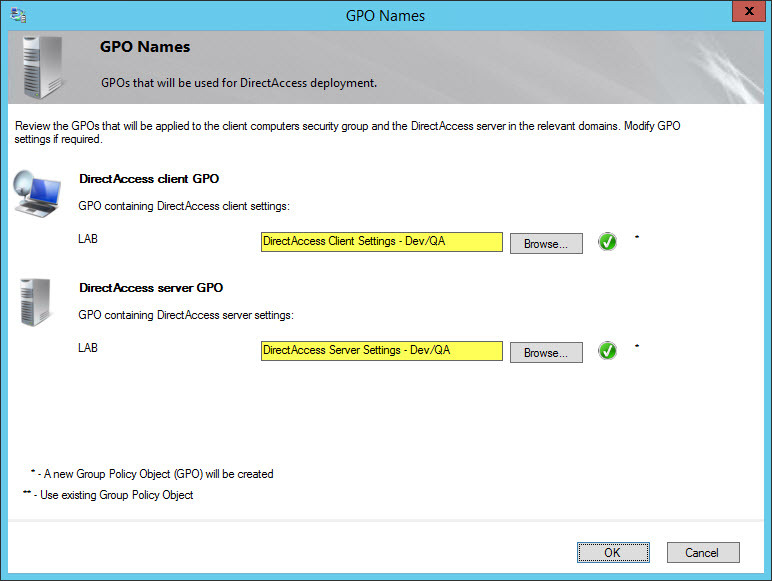 It is possible to change the names of GPOs using the Remote Access Management console when you first perform the initial configuration of DirectAccess, and I commonly make this change. If it wasn’t supported, I don’t think they’d provide the ability to change them in the UI. Also, it is not mentioned at all in Microsoft’s formal unsupported configuration guidance published for DirectAccess here – https://technet.microsoft.com/en-us/windows-server-docs/networking/remote-access/directaccess/directaccess-unsupported-configurations. As for security filtering not working, it sounds like you might have enabled the option to apply DirectAccess settings to all mobile computers. That is definitely not recommended. Check your configuration and disable that option if it is enabled. Also, make sure you are using unique security groups for each DirectAccess deployment, and that DirectAccess clients are members of only one of those groups at a time. If they belong to both it won’t work. Noted, thank you sir. I did check both items you had mentioned — Apply to all mobile computers is not selected, and we are in fact using unique security groups. For what its worth i got an update from Microsoft, and they are stating that the issue is because both single server deployments are in the same site/domain, which could be causing the problem. Based on your information here it looks like that shouldn’t be an issue? I am not aware of any issues with deploying multiple instances of DirectAccess in the same domain and AD site. That doesn’t mean there isn’t something I’ve not yet encountered, however. If you are unable to get satisfactory resolution with Microsoft, drop me a note directly and I’d be happy to provide some assistance and guidance for you. Multi-site question. I have two DA servers. Same network. But, I can’t use real load balancing. 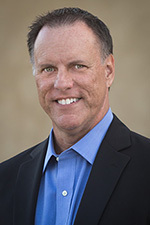 VMware, etc. So, I set them up as two sites. The first works just fine. The second however does not. When connected to the second site (which I can specify manually), IPv6 traffic flows. I can ping machines on the other end. But name resolution does not. There is only one DNS address being put into my clients NRPT. It is reachable when connected to the first DA site. But not the second. Teredo is working with both. 6to4 is disabled. Any clues here? It seems weird to only have one DNS64 address being in the NRPT. I’d think that would need some mechanism to be changed per-site. This is a known issue. When deploying multiple DirectAccess servers on the same subnet in a multisite configuration, you must also disable duplicate address detection by issuing the following command in an elevated PowerShell command window on each DirectAccess server. I have an existing DA server that I had been running on Hyper-V. I migrated the server to VMWare and the NIC changed. When I try to go back into step 2 to change the nic to the new one, I get an error message stating that ipv6 is not configured on the new nic when it has been. From what I’ve read, the DA configurator sets the ipv6 info at initial install time and that I would have to delete my config and start over again. Or I could install a 2nd server and move everyone over to that one. 1. is there a way to change a nic easily in DA without wiping out the config that is currently set? 2. if I create a new server, is there a way to migrate those users to the new server without a direct link to the LAN? all of the stations affected are mobile users, and they are scattered throughout the country. There is only one homebase and no real satellite office with a more direct connection to the LAN. I’d rather not have to ship replacement machines to all of my remote users if I could prevent it. I think it might be possible to hack the DirectAccess server GPO to reflect the change of network adapter. I’ve never done it myself, but if you look at the new value of InstanceID when you run Get-NetAdapter and update that detail in the GPO it might work. You could easily add another server to the cluster and you wouldn’t have to update any settings at all. If you created a new DirectAccess deployment you’d have to get clients connected to the LAN to update the settings. Thanks for providing such reliable guidance for DA configuration and best practices. Your videos and website are gold (esp your newest DA 2016 video on Pluralsight)! We recently expanded our DA configuration to multisite and now have a single server in each of two datacenters. Everything is working but I found that the DA Server GPO is filtered to apply only to the original/first server. Is that the correct outcome for a multisite installation (no clusters, no load-balancing)? Ah of course…and there it is! Once again your guidance is appreciated…seems I didn’t modify that policy label to align with the previous/original and so it got lost in the list of our GPOs. Cheers! Hi Richard, I have 2 single DA servers in the organisation. I got 2 directaccess-WebProbeHost in DNS. All network is IPv4. I got 1 ectaccess-corpConnectivityHost 127.0.0.1. Do i need to have 2 directaccess-corpConnectivityHost AAAA IPv6? When i ping directaccess-corpConnectivityHost from 2 diferent client i got 2 diferent IPv6 responds. Thank you. If you have two separate DirectAccess deployments, then you should have one entry for directaccess-corpConnectivityHost that resolves to the IPv4 address 127.0.0.1 and two entries that each resolve to the IPv6 address beginning with your NAT64 IPv6 prefix for each deployment and ending with ::7f00:1. For the record though, DirectAccess seems to work without issue even if these DNS entries are not present (at least with 6to4 and Teredo disabled anyway). Yes, you can deploy DirectAccess in a multisite configuration using a single NIC. In fact, you can even mix and match if you like. One entry point could have single NIC DirectAccess servers and another point could be multihomed. You just need to make sure that all DirectAccess servers in the same entry point are configured identically (single or multi-NIC). I am currently running a parallel Direct Access 2016 environment with an external load balancer. This environment has been setup exactly the same way as the working prod environment. I have come across a couple of issues which I am not sure if they are related to each other. Unusual. The only thing I can suggest is that you make certain that your DirectAccess client belongs only to a single DirectAccess security group at a time. If your client is included in both groups (old and new) you’ll have all sorts of problems. Thanks for your response. Thought I post the my findings in case someone else comes across similar problems. It appears that the issue was GPO related. Both the old and new ” Direct Access Client Settings” GPO’s was applying to the client machine causing all sorts of problems. I had to block GPO inheritance on the OU the new GPO was linked to then force a GPO update. I then checked that the new GPO was the only one applying and confirmed that everything started to work. A pretty simple mistake but I overlooked the way that the old GPO was applying to the rest of the environment.